Thanks to a helping hand from Fed Chair Powell, Asian currencies are looking stronger across the board today. 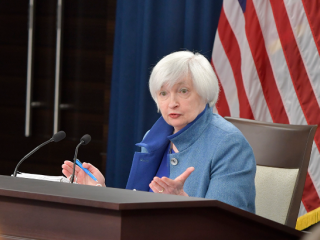 Risk assets in the region will take heart from the Fed's capitulation to markets. But don't write off hikes too soon. Another great piece by London's James Knightley on the FOMC decision overnight - he's not paying me to write this either (though James, you know where to send the cheque if you insist). I particularly liked it as it entirely coincides with my own unofficial view of the Fed, that June still looks a good call for another rate hike, with both wages, and inflation likely to be sending a strong message for a further (and possibly final...) hike then. And this is where I take issue with the current message from the FOMC. Because if the data says, "hike" and both James and I seem to agree that before too much longer it will, then the market currently isn't poised for this and is being steered by the Fed to an entirely different conclusion. We can all enjoy the risk-on sentiment while it lasts. But such inconsistent guidance sets us all up for an awkward correction later on. This could be particularly nasty as the higher inflation and wages backdrop might coincide with a weaker projection for future growth, and that is a tough one for risk assets, especially equities to digest. Summertime blues then? In the last 5 days, most Asian FX strength has come from the CNY, but also the perennial outperformer, the THB, and SGD. PHP hasn't been too far behind. The near term might provide some further boost to external balance offenders, IDR and INR, which stand to benefit most along with the PHP from generalized USD weakness. The Asia Dollar index is pushing higher above its 200-day average and most likely will widen the gap now. 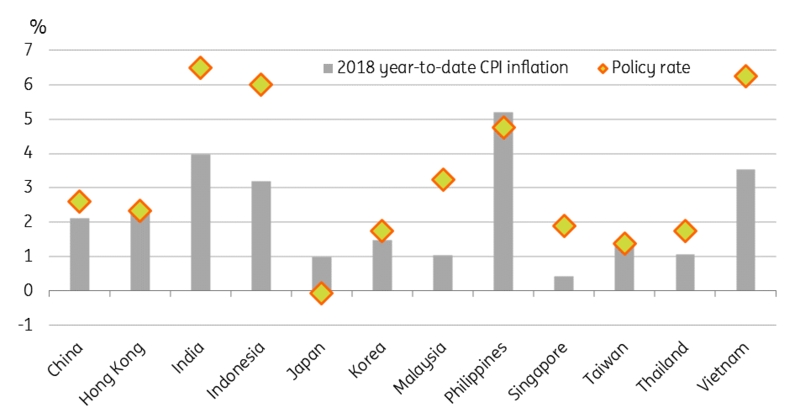 Which makes us think, with Asian FX pushing higher against the USD, inflation largely under control and likely to remain that way, and global headwinds to growth growing, isn't there a case for some regional rate cuts this year, against expectations for no change for most central banks? Both the Reserve Bank of India (RBI) and Bank Indonesia (BI) have the greatest room to cut in our opinion, with high real interest rates giving them room to ease back. RBI meets next week, and though we aren't forecasting a cut from them, we would certainly put this in the category of "don't rule it out". The main argument against cuts for both the RBI and BI is that stronger oil offsets the weaker USD. but not entirely. Another two Asian central banks spring to mind, both of which hiked last year for reasons we struggle to fathom. Bank of Thailand (BoT) and Bank of Korea (BoK) could both reverse last year's hikes. With the THB one of the regions strongest currencies, there is certainly no need to protect the currency with unnecessarily high rates. indeed, the domestic economy could do with a boost to get their massive current account surplus closer to balance. There's a fair bit on the calendar to digest today. Korean industrial production for December was down 1.4%MoM. I don't care than the year on year rate exceeded the consensus 1.5%YoY forecast by 0.1pp - that only tells me that the near term history has been revised to look a little less bad. but today's December month on month number suggests that the downturn in production is accelerating. That is cause for concern. Japan's production figures aren't much better, falling 0.1%MoM, and -1.9%YoY. We will almost certainly be revising our 2018 full year forecasts for Japanese GDP downwards, and that probably implies a downward nudge to the 2019 forecasts too. PMI data out of the region is likely to make for difficult reading. China's manufacturing PMI index is likely to fall a further 0.1pp or more today. 4Q18 GDP data from Taiwan are not likely to impress either, with a 1.6% print expected by our Greater China Economist, Iris Pang (consensus 2.0%YoY). And finally, I learned from Singapore's own Money FM radio channel on a call with them today that it is "Hug an Economist" day today. See here for more details. Please form an orderly queue.